Flowers are typically known for their beauty or pleasant smells but they often provide many more benefits than just those. With so many species of flowers out there in the natural world, it is easy to imagine just how many powerful benefits we may be missing out on. Some flowers have been used in ancient medicinal and cosmetic practices but have long since been forgotten in modern times. By learning more about these flowers, we can open up a new world of opportunities for natural health and beauty practices. In this article we will look at a flower called agrimony which has a wide range of potential health benefits ranging from treating bleeding and diabetes to aiding the skin and hair and emotional issues like anxiety. Agrimony is actually a genus of fifteen different flower species although it is frequently used in reference to a single, general species. These flowers are all perennial and can be found throughout areas of Europe, Asia, and North America, where they have been used traditionally over a course of centuries for their significant medicinal benefits. Today, those benefits are still being studied but it is hard to argue with several centuries worth of facts. Agrimonia eupatoria, or common agrimony, is most popular in areas of Europe. Hairy agrimony, on the other hand, scientifically or botanically named Agrimonia gryposepala, is popular in areas of North America. Other names that may be used to refer to agrimony flowers as a whole include church steeples, cockleburr, cockeburr, sticklewort, and philanthropos, depending on where you are in the world. The flowers of any of the many agrimony species can be easily identified by their bright yellow flowers and their long pinnate stems. The flowers are typically very fragrant but the smell may resemble a range between lemons and apricots, depending on the species. Generally speaking, they grow to be around one or two feet tall and have a woody stem with silky hairs on them; hairy agrimony has a thicker covering of these hairs, which is where it gets its name. The leaves of the flower are dark green and are larger, seven inches in length or more towards the bottom. As many flowers used in ancient times will, agrimony has a lot of historic folklore attached to its many species. It has been said that witches would use agrimony as a form of protection against hexes as well as an ingredient in many different types of spells. The flowers would be placed in sachets and hung around the home as a form of protection against things such as evil spirits or poisoning. Voodoo practitioners also used agrimony flowers in similar ways to protect against jinxes and curses. Generally speaking, many of these practitioners believed that agrimony would also send the curses or jinxes back to the person who cast them originally. Today, a lot of these ideas have stuck with modern practitioners. It is a common practice for Wiccans in today’s society to put agrimony leaves in their pillowcases to promote better sleep. Agrimony flowers, along with their stems and leaves, contain many beneficial compounds that allow the natural substance to provide a wide variety of significant health and cosmetic benefits. Two primary active compounds include catechin and thiamin; catechin is an antioxidant and a water-soluble polyphenol and thiamin is a water-soluble form of vitamin B. The flowers also contain large amounts of quercitrin, which is a powerful antioxidant and anti-inflammatory agent that actually provides the flower with its rich yellow color. High concentrations of tannin, a complex polyphenol, are also present, which provide powerful and natural astringent properties. Other compounds present in agrimony flowers include palmitic acid, silicic acid, and ursolic acid; these acids are all very beneficial for separate reasons. For example, palmitic acid is a very common saturated fatty acid found in plants and animals that have been shown to potentially prevent and fight cancer. Silicic acid has been shown to be beneficial both medically and cosmetically for the skin, nails, and hair. Ursolic acid, a pentacyclic triterpenoid, is common in many different kinds of fruits and herbs and it provides diuretic and anti-inflammatory benefits. Thanks to the many nutritional compounds found in agrimony flowers, they provide a lot of significant health benefits. Agrimony is commonly used as a coagulant to reduce bleeding caused by minor wounds, cuts and grazes. You can make an acrimony tea and apply it to your wound in the form of a compress to help stop bleeding. The same coagulant properties that make acrimony a useful remedy for wound could also help women suffering from heavy menstrual bleeding. The active compounds present in agrimony, including thiamin, catechins, and quercitrin, have been scientifically associated with better health for the gallbladder and liver. When the liver and gallbladder are in better health, they can eliminate toxins from the body more efficiently. This detoxification can help to promote metabolism issues and prevent or treat serious health conditions. Similarly, the antioxidants present in the flower can help detoxify the skin. Agrimony may detoxify the skin of a wide range of skin issues such as blemishes, rashes, acne, and pimples as well as various skin conditions such as eczema or psoriasis. Agrimony can also help the body process things more efficiently. For example, its anti-inflammatory properties can be used to treat gastrointestinal and digestive problems such as diarrhea or other symptoms of irritable bowel syndrome. Generally speaking, agrimony can ease irritation and inflammation within the gut to provide relief for various stomach issues. Similarly, agrimony can also ease inflammation that may be causing respiratory conditions, such as bronchitis, chronic coughing, sore throats, or other sinus problems, to heal and recover the body more efficiently. If you are suffering from a cold, sore throat or cough, try drinking a few cups of agrimony tea and you will hopefully start to feel better in no time. Until more studies are done, however, it would be best not to rely on agrimony as an anti-diabetic and to speak with your doctor before attempting to treat your diabetes with it. In the ongoing search for a cure for cancer, scientists are leaving no stones unturned. because of its incredible antioxidant and anti-inflammatory propertieses, it is possible that agrimony will play a future role in the fight against cancer. Antioxidants fight and eliminate free radicals, which are the results of cellular respiration that may cause a number of diseases including cancer. Agrimony is being seriously studied as a cancer treatment due to its high concentrations of antioxidant compounds. Anybody that suffers from anxiety and stress will be very aware of its debilitating effects. Many people turn to powerful pharmaceutical remedies but unfortunately they are not always effective and they bring a very real risk of dependency as well as a long list of potential side effects. Fortunately, there are plenty of more natural remedies that can treat anxiety and stress and agrimony may be one of them. Unfortunately, there have not been any studies done on these benefits but many people who have used it claim that agrimony oil or essence as an effective natural way to treat anxiety or restlessness. It is certainly worth a try since the research done to date suggests agrimony is largely well-tolerated. It has also been said that dogs may benefit from agrimony although there have not been any studies into those benefits either. You should speak with a doctor or vet before exploring these benefits, however, to be sure that consuming even small amounts of the oil will not cause any negative side effects in you or your pet. One significant benefit of agrimony is its use as an astringent agent. This property makes it easier to control your bladder, which can help to stop accidents or bed-wetting that children often experience. Agrimony is, in fact, non-toxic and has not been associated with serious side effects so it should be safe for use in children. Its common use as a treatment for anxiety could also be beneficial for children who suffer from separation anxiety. Agrimony contains a number of nutrients including silicic acid which can benefit the health of your hair and nails. Agrimony can enhance the strength of your hair and your nails and prevent breakage while keeping your hair and nails looking healthy and attractive. You can also apply agrimony topically to treat a wide range of common skin conditions. Agrimony is full of powerful antioxidants that can help protect against damage caused by free radicals and prevent many of the signs of aging like wrinkles and fine lines on the skin. The very powerful anti-inflammatory properties of agrimony can also help treat many common inflammatory skin conditions including eczema, psoriasis and rosacea. It also has astringent properties which help strengthen the skin keeping it looking tight and healthy and preventing it from sagging. Agrimony is commonly made into a tea to experience the many benefits that it has been studied and proven to provide. There are still many ways to use it, however, depending on the results that you wish to see. For example, a strongly-brewed tea could be gargled to treat sore throats or coughs. On the other hand, a weak tea could be sipped throughout the day to help alleviate diarrhea. Strong tea could also be used to soak a compress and apply to the skin to ease inflammation. With that said, agrimony can be used in other ways as well, not just as a tea. Depending on where you look, you can find dried agrimony stems, leaves, and flowers, which are often used for teas or to home-make certain products. You may also find agrimony in the form of a ground powder, extract, or essential oil. Making a healthy cup of agrimony tea is a very simple process. The leaves you need are widely available these days either online or in your local health food store. Add a teasppoon of dried agrimony leaves to a cup. Boil up a pot of water and pour over the leaves. Allow the tea to steep for up to 10 minutes to make sure you get all the benefits of the tea. Add some honey and a slice of lemon to taste. Agrimony is considered safe to use in appropriate doses for a short period of time but there is little data regarding its long term use. Agrimony contains tannins which may be unsafe if taken in very large doses. Agrimony can cause the skin to become more sensitive to UV rays in some individuals. 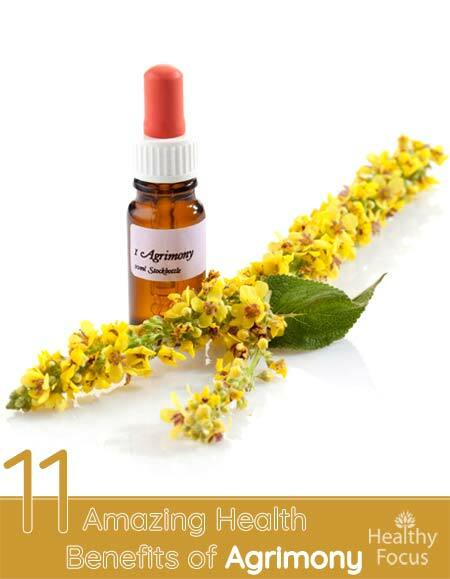 Pregnant women should avoid using agrimony since it can affect menstruation. There is insufficient data regarding the effect of agrimony on babies who are breastfeeding. It is recommended that nursing moms stay on the safe side and avoid using the herb. Research suggest that agrimony reduces reduces blood sugar levels. Indiciduals with diabetes are advised to consult their doctor or health care provider before using agrimony. Because of its affect on blood sugar levels, you should not use agrimony in the 2 weeks leading up to surgery. Overall, it’s pretty clear that agrimony provides a lot of significant health benefits. Studies have revealed that agrimony possesses powerful antioxidant and anti-inflammatory compounds giving the herb a wide range of potential health benefits. It can also even be used to treat the skin and to strengthen the hair and nails, which only adds to the list of powerful benefits. With that said, not all of the benefits have been fully studied so you should be patient and cautious when attempting to use agrimony to treat any type of health conditions. It would be wise to speak with your doctor before attempting to use agrimony as any type of treatment for a health condition. Your doctor would be able to better determine if using agrimony might interfere with any condition or medication you may be taking. If your doctor approves, you might also wish to speak with a holistic healthcare practitioner as he or she would be able to give advice regarding dosage and methods of intake.